My mama, papa, brother and I lived with my two maternal single aunts: Tiya Viring and Tiya Liling. Tiya Viring was a former high school teacher but opted to follow the footsteps of my other maternal aunt, Tiya Noneng, in being textile wholesaler/retailer in Divisoria. 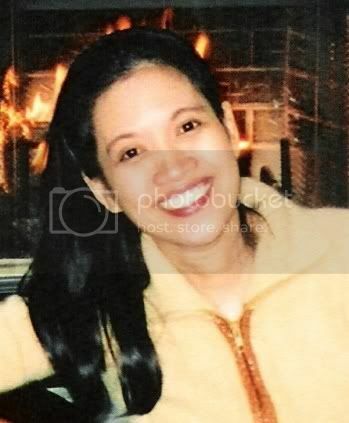 Tiya Liling was a school teacher too. We lived in what could be termed the "ancestral" home. Beside our house, is my Tatay Jamen's house. Tatay Jamen was my mother's lawyer brother. Tiya Noneng lived about a block from our house. Papang, the doctor and eldest brother of mama lived in Quezon city. Back when the gas price was 25 centavos per liter, the whole de Leon clan congregated in the ancestral home for Noche Buena. In the Philippines, Noche Buena is celebrated on Christmas eve. It is the time for family to get together at midnight, break bread and open gifts. Well, that's how we celebrated our Noche Buena when I was a child. I do recall that we usually have ham, quezo de bola, sopas, embutido, potato salad, menudo, etc. for Noche Buena. After church, everyone goes to our house and eats dinner. After dinner, a lively conversation follows while everyone awaits the clock to strike 12 midnight- for another eating binge and for gift giving. As the clock nears the designated time,I was usually all keyed up for the gift opening. Bong! It's 12 midnight and I zoom like Speedy Gonzales through all my gifts. Then I take stock and count my gifts and say out loud who did not give me one. As I grew older, so did my relatives. In time, my papa, two of my aunts and two uncles left us. My cousins got married and had their own families to share Christmas with. Some cousins and even my own brother migrated to the US. Eventually the Noche Buena celebrated most happily and noisily at the ancestral home became " no more". That's me at the center looking for gifts. 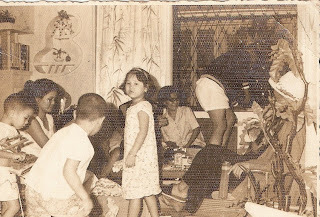 This was taken at the old house around 1964-65.
buti ka pa, you've kept old family photos. I just have to say....ang cute mo!!!!!!!!! Kahawig mo si Tita Vi...seriously! Omg, sobrang vintage photo. Its nice to keep those. Noche Buena is also an anticipated event for us too. Dati sobrang puno ang bahay ng bisita and kamag anak pero syempre nababawasan din dahil yung iba nag abroad na at yung iba nag asawa na. Pero yung immediate family namin intact parin. All 7 of us kids and our respective families still celebrate it here sa bahay namin along with our parents. Our Noche Buena food remains the same. Meron pa rin kaming ham na binibili pa sa Kalentong, the Marca Pina Quezo de Bola. My mom still cooks everlasting (parang embotido), rellenong bangus, hamonado and valenciana. cherry: it was my mom who has kept the pictures. i think my cousins have some old pics too. domjullian: sarap naman ng handa nyo. saan ba bahay nyo at maka punta dyan. we celebrate noche buena here in our house - 5 kids, 2 grandson, hubby and i. sometimes we invite people over. this year i'm not inviting anyone but two people already invited themselves. dec 25, we go to my mom's place than trot back to my in-laws naman. kapagod!